Local medium and television star Tyler Henry wrote memoir, "Between Two Worlds: Lessons from the Other Side." Local medium Tyler Henry wrote a memoir titled, "Between Two Worlds: Lessons from the Other Side." Pearl, the dog of local medium Tyler Henry, investigates Henry's new memoir, "Between Two Worlds: Lessons from the other Side." When Tyler Henry was 10 years old, he awoke one night with a premonition and an “overwhelming knowingness” that his grandmother was going to die. He told his mother they needed to say goodbye to his grandmother, but before they made it out the door, he said his mother received a call informing them that his grandmother had died. Over the past 11 years, Henry, 21, said his intuition has continued to come through to him. He said he finds his intuition comforting, and said people he has encountered and who he has shared his impressions with have also found his impressions comforting or insightful. Henry said he began doing readings at 16 in places like the Cosmic Corral in Hanford and for friends and teachers in school. While in high school at Sierra Pacific, Henry said he took classes at West Hills College Lemoore with the full intention of becoming a hospice nurse. During his time at the college, his career as a medium began to unfold. “I ultimately feel like I was able to achieve the same goal of helping people toward the end of life and giving comfort and reassurance, just in a different way,” Henry said. Henry said as people gained interest in him, he started going to Los Angeles to have readings with clients. He said his mom would drive him to Los Angeles every weekend to do readings with clients in Hollywood. Word of mouth spread about his readings, and he was then approached for a television show with celebrity clientele. Last year, E! Entertainment Television began airing the television show “Hollywood Medium with Tyler Henry.” Henry’s publicist Ron Scott said the show was such a success the first season the network immediately picked it up for a second. He said the show will be returning in mid-May and will be airing 20 new episodes. “I have seen him give closure to so many people,” Scott said. “He is truly an amazing young man with an incredible gift." Henry has read people from Ellen DeGeneres to Matt Lauer. He said he never knows where he’s going or who he’s going to be reading on the show, adding it’s always interesting on the show to just sit down with a client and see what comes through. He said his ability has its challenges, mainly dealing with overwhelming emotions, but it’s a gift to be able to connect people with their loved ones. Carollyn De Vore, a former Hollywood agent and now casting director, started a studio in Fresno 22 years ago to help people who are interested in modeling, acting and dance in the Central Valley. De Vore said Tyler came into her studio at age 16 with his mom, Theresa. She said Henry was shy and cute, but also goal orientated. De Vore said Henry went to her studio to work on his confidence, but said she thought there was something more to him, though she was not sure what it was at the time. She said eventually Henry’s mother shared the news that he was a medium. Henry took workshops to build his confidence, and De Vore said he was charming and everyone at the studio adored him. Henry said his memoir gives him a chance to tell his story of how he got to where he is today, but said it’s also about conveying the importance of the readings and the sense of healing that is gained by his clients. “Whether someone is grieving and looking for a resource for comfort, or they’re just interested about how the process works, there’s something to be gained in reading [my book],” Henry said. 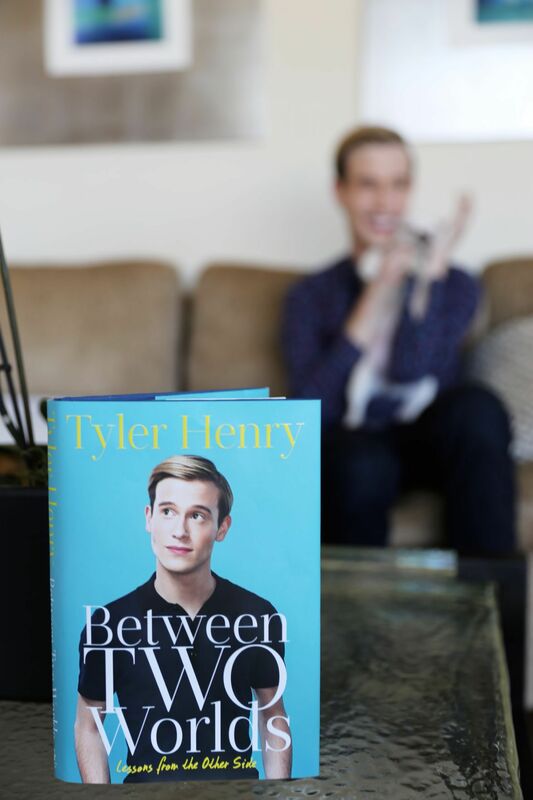 "Between Two Worlds" is available to buy and a book signing will take place at 1 p.m. Saturday, Feb. 25, at the Barnes & Noble in Fresno in the Villaggio Shopping Center, 7849 N. Blackstone Ave.
“Hollywood Medium” Tyler Henry isn’t living large now that he’s a resident of Los Angeles. James Randi offers a million dollars to anyone who can prove psychic ability. If you are truly "gifted", take him up on his offer. This is just another sad ruse to make money from the sad and grieving. Shame on you. Deuteronomy 18:10-12 tell us that those who consult the dead are disgusting to the Lord. This kind of fakery - taking advantage of people who are grieving - is disgusting period. Shame.